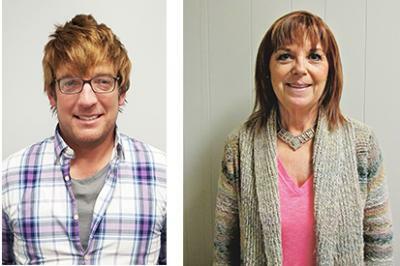 Mid-America Publishing Corporation is pleased to announce the promotion of two employees to its executive team. Clinton Poock, a 10-year member of the Mid-America family has been promoted to vice president of marketing. Poock will lead the development of new marketing initiatives and assist with sales training and coaching through the entire Mid-America company. "We are pleased to see Clint join our executive team," said Ryan Harvey, President and CEO of Mid-America Publishing. "Having Clint in this executive level position will allow us to draw from his vast marketing knowledge in both the print and the retail industry as we roll out several new key initiatives to better serve our clients and markets." Poock lives in Cedar Falls with his wife, Sara, and three children. As he transitions into his new role, Clint will continue to serve as publisher of the Eldora newspapers, Grundy Register, The Eclipse News-Review, Butler County Tribune-Journal, and Clarksville Star. Toni Venteicher, a five year member of the Mid-America family has been promoted to vice president of sales. Toni's primary role will be to assist in the hiring, training, and coaching of our sales and marketing team but she will also work with Clint and the staff to evolve our pipeline of products and services to help our advertisers reach more potential customers more effectively. "Toni has a unique skillset," Harvey said. "Her innate ability to connect both with clients and our sales and marketing consultants makes her the perfect fit for this role. Toni has been easing into this role with us for the past 18 months and we're very happy that she has accepted the challenge of formally moving to the next level." Venteicher, a long time Calhoun County area resident and proud mother of four adult sons, will continue to live in Lake City. In addition to her new VP role, Venteicher will continue serving clients directly as a marketing consultant herself for The Graphic-Advocate and The Spectrum in Calhoun County. "As the new management team Toni, Clint and I will continue to build upon the successes of Mid-America Publishing to date and also work to bring in more business for clients through creative application of our large portfolio of marketing solutions," Harvey added. "Ultimately our goal is to be able to expand our product and service offerings in our primary and neighboring markets and eventually throughout the state and nation."